Costa Rican David Rodriguez became the first boxer in the history of his country to take a medal at an AIBA World Championships today. His gutsy performance wasn't enough to secure a passage to the finals of Almaty 2013 though. We had a stunning afternoon of boxing with the Light Flyweights (49kg), Bantamweights (56kg), Light Welterweights (64kg), Middleweights (75kg) and Heavyweights (91kg) all in action. Yosbany Veitia Soto struggled for the first time in this tournament against Birzhan Zhakypov, the Kazakhstan Light Flyweight. The two southpaws looked very focused as they went into the first round with Soto looking particularly psyched up. The Kazakh looked the more composed of the two though and got on his bike early, scoring some nice jabs and long range hooks as the Cuban tried to close with his opponent. Round two started in much the same way with Zhakypov landing a heavy jab on the Cuban a few seconds in. By normal standards in this World Championships, the crowd was relatively quiet and this gave some space for the Cuban to operate. The round was over in a flash though and the Cuban looked frustrated as he sat in his corner. He had to chase the bout by this stage with the Kazakh clearly the more effective so far. Zhakypov looked comfortably ahead and began boxing with his hands down. Even so he was able to pick his opponent off and Soto was left looking dejected as the Kazakh boxer's arm was raised in triumph. In truth, Zhakypov looked like he was in another league to (the very talented) Soto and will now face the Algerian Mohamed Flissi in the final (see below). Russia's Vladimir Nikitin looked awesome against Mykola Butsenko of Ukraine in a bout between the international neighbours at Bantamweight. There was no hesitation in this bout with both boxers going straight for it, right from the opening bell. The Ukrainian boxed with his lead hand low to invite the Russian in, which he was duly obliged to do. Thus the action was frenetic. The southpaw Ukrainian wasn't able to avoid as many shots as he has in the previous rounds and began to take punishment; and Nikitin is not a man you want to take punishment from. He has been on our radar for the whole tournament thanks to his performances, and he continued to look good today. He really began dishing up the punishment as the bout wore on and it was he that went through to the finals. There he will meet Javid Chalabiyev of Azerbaijan. The Ukrainian looked disappointed but nonetheless goes home with a bronze. Clemente Russo was back in action against Teymur Mammadov of Azerbaijan. Clemente looked at his usual brawling best in this Heavyweight match up. In round two, he landed a number of heavy overhand rights and lefts against his taller Azeri opponent. Notably Russo's hands were up all the time in this bout in contrast to in previous rounds. This was probably out of respect for his opponent's reach. At times, the Italian looked very fast on his feet as well. Russo, with his experience is certainly good at conserving energy, which then allows him to explode as required. "I feel good because Mammadov only really landed one good punch to my chest and then he stopped", said Russo following his win. While we spoke to the Italia Thunder man, the other semi-final in his weight category was taking place and we asked him for his prediction. 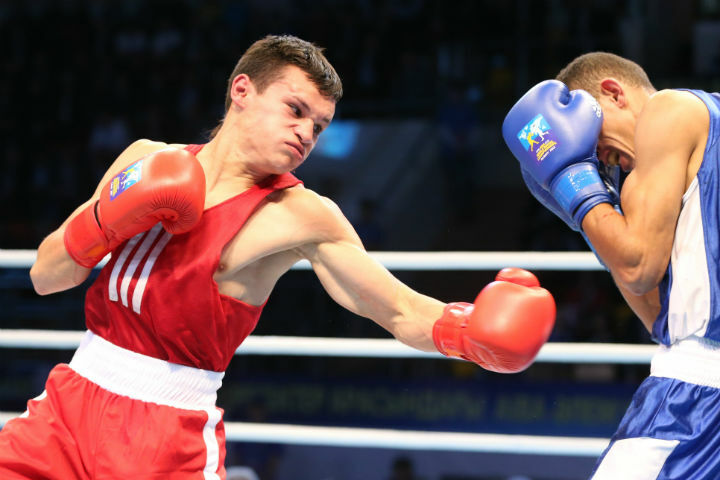 "I lost to Tishchenko in a bout we had at a small event before the Olympics", he said. "He is a very technical fighter and it's extremely difficult to get through his guard. Although Peralta is also great, I think my opponent in the final will be Tishchenko". Russo was duly proved right and the Italian will square off with the Russian tomorrow. Elsewhere, former British Lionhearts boxer Jason Quigley of Ireland took on Artem Chebotarev of Russia at Middleweight. Quigley who looks huge for a man of his weight is also surprisingly springy on his toes. Chebotarev increasingly drew the Celtic boxer into a slugfest in round three. Yet despite this being the preferred tactic for the Russian, it turned out that this worked out extremely well for the Irishman. It transpires that Quigley was actually the better boxer in this kind of situation and certainly punches harder, not to mention more accurately. With Quigley being both the better dancer and brawler, there wasn't much the Russian could do tactically to adjust the direction the fight was taking. Quigley now goes to the final, much to the joy of the vocal traveling Irish support. "I went through our tactics last night with my dad and coaches. We decided to hit and move. I knew I had the speed and ability to beat him but in the last round, they told me to go forward and go at him, which I did and I landed some lovely heavy shots". He will now face the Kazakh boxer Zhanibek Alimkhanuly who progressed with a walk over after England's Antony Fowler had to withdraw with a broken hand. Light Flyweight David Rodriguez of Costa Rica made history today as the first Costa Rican to medal at a World Championships. The Road to Almaty boxer took on the skilful Algerian WSB boxer Mohamed Flissi, who has been impressive throughout this tournament. Rodriguez found it difficult to find his range in round one but mixed it better in round two. Flissi looks exceptional at the moment though. He is hard to hit and possesses dangerous hooks, good movement and a willingness to really scrap when necessary. That makes him a tough opponent to beat. Rodriguez landed some big shots late on in round one to his credit, which perhaps closed the gap somewhat. In the end it wasn't enough and it was Flissi who advanced. But winning the first ever medal for your country at this level is something that Rodriguez should always be proud of. Thus he was in effect victorious even in defeat. A somewhat redundant category in some sense at this stage of the competition, however, if you were to watch one boxer in the finals based on this afternoon's performance, it should be Merey Akshalov of Kazakhstan at Light Welterweight who overwhelmed his opponent, Everton Lopes of Brazil. The Kazakh has looked almost invincible through this tournament and the manner in which he despatched of the reigning World Champion was noteworthy. He seems comfortable at every range and distance and can adjust his tactics according to his opponent. Tune in to see him box tomorrow against Yasnier Lopez of Cuba. The Swedish national coach confused a few people when he turned out to coach several Argentinian boxers during the tournament. When this unexpected alliance was investigated, it turned out that the coach who is now living in Sweden is actually an Argentinian who used to box for his country when he was younger. So when he saw that his old team needed assistance, he was happy to jump in.